Several studies have implicated radiation therapy in the pathogenesis of secondary malignant neoplasms (SMN) after the treatment for a primary cancer [Table 1]. Approximately, two-third of these SMN occur in or at the edge of the irradiated field.,, Increasingly, effective therapies for childhood cancer developed over the past decades have revolutionized the practice of pediatric oncology. As cure rates increase, more and more children are at the risk for long-term toxicity., Among the most dreaded late sequelae is the development of SMN. In previous reports with long follow-up times, 5–10% of all children treated for a first malignancy developed SMN.,, Several recent reports have attempted to identify patient genetics or therapy-related risk factors that might play a role in the development of SMN following treatment for childhood cancer. Radiation-induced neoplasms occur at the edges of the irradiated field, where the radiation does not cause cell death but is sufficient to induce malignant transformation., Vigilant surveillance and long-term follow-up should be emphasized in all survivors of childhood cancer. A 20-year-old Indian male was diagnosed to have medulloblastoma at the age of 2 years. He was treated with surgical resection followed by radiotherapy to craniospinal axis. He remained asymptomatic for a period of 18 years after radiotherapy till he presented with bilateral neck masses. These were multiple, firm to hard on palpation and were nontender. There was no associated difficulty in swallowing or breathing. There was no history of fever, pain in the neck, or weight loss. 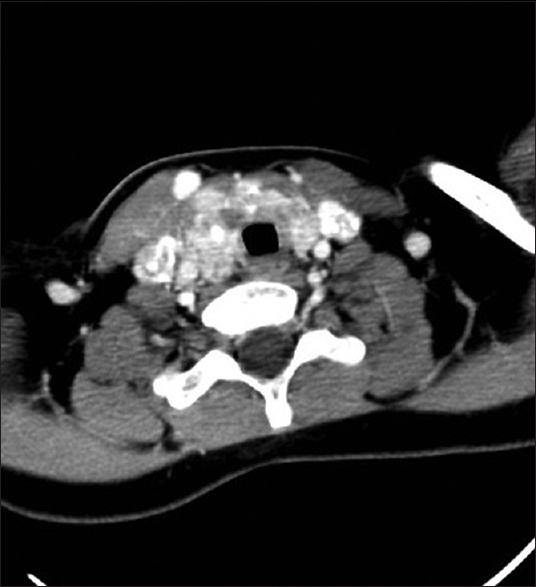 Contrast-enhanced computed tomography (CT) of neck, chest, and abdomen was done. CT scan of the neck revealed diffusely enlarged thyroid gland. Multiple heterogeneously enhancing nodular lesions showing calcifications were replacing the normal parenchyma [Figure 1]. Multiple enlarged intensely enhancing lymph nodes showing enhancement similar to thyroid lesions were noted at Level II, III, and IV bilaterally [Figure 2]. 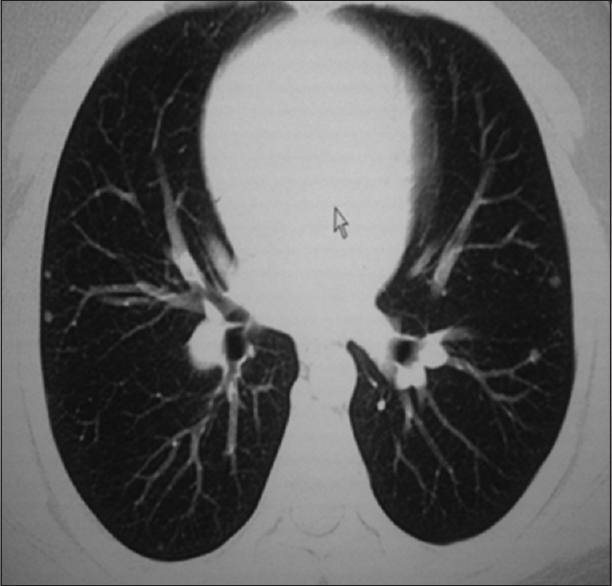 CT scan of the chest revealed multiple small nodules of average size 5 mm diffusely scattered in both lung fields [Figure 3]. No lesion was found in the abdomen. Cytopathological examination of the lymph node revealed deposits of papillary carcinoma Category-V (The Bethesda System of reporting thyroid cytopathology) [Figure 4]. 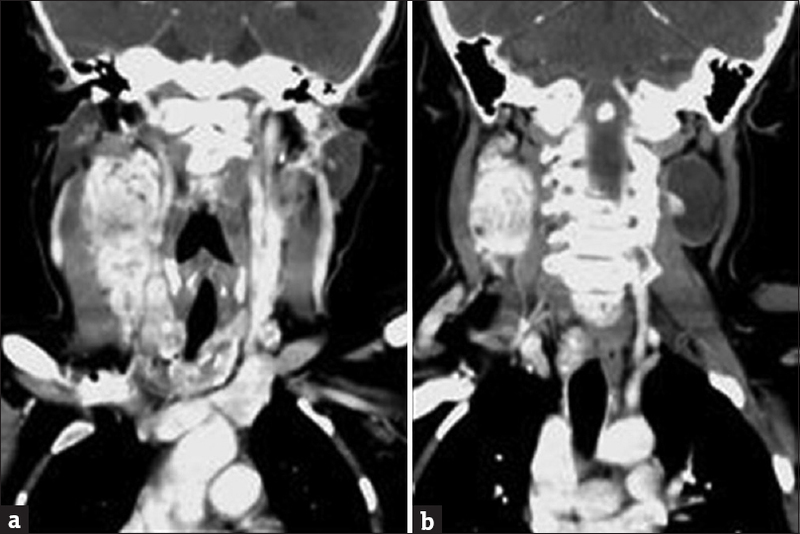 The patient underwent total thyroidectomy with neck dissection for the lymph nodes and histopathology proved out to be papillary carcinoma of the thyroid with metastatic cervical lymphadenopathy. Adjuvant treatment in the form of radioactive iodine ablation was also given for the metastasis. The patient responded well to the treatment and remained asymptomatic with no features to suggest progressive or recurrent disease during the follow-up period of 2 years. Cranial irradiation is widely used for treating neoplastic diseases. Such treatment results in longer survival of patients, although long-term toxicity such as delayed radiation necrosis and irradiation-related arteriopathy can occur in the brain.,,, The induction of SMN is a rare but well-documented serious sequelae of therapeutic irradiation. The risk of SMN is higher in patients who undergo radiation therapy at an early age, particularly those under 5 years, with a prevalence of 2.6–38.8%, which is 6–10 times higher than in the general population., The period of latency varies from 8 to 15 years after radiation therapy. Latency has been noted to be inversely proportional to radiation dose, with shorter latency periods often seen following administration of higher doses. Papillary thyroid carcinoma has been described in patients of medulloblastoma treated with radiotherapy. Because of the high sensitivity of the thyroid gland to low-dose irradiation, these neoplasms are strongly associated with radiation exposure, particularly under 2 years of age. The pathogenesis is the rapid cell proliferation during glandular development. This strong association is verified by numerous reports from survivors of Hiroshima and Nagasaki; the Nevada, Novaya Zemlya, and Marshall Island atmospheric tests; and the Chernobyl plant accident, as well as by earlier investigations of the medical use of radiation for benign diseases in childhood such as thymic enlargement, adenoid or tonsillar hypertrophy, acne, or tinea capitis. Thyroid cancer accounted for 7.5% of the SMNs reported in a series of childhood survivors of malignancy. This risk persists for up to 30–40 years after exposure. The exact prevalence of thyroid cancer as an SMN is still unknown and is probably underestimated. Almost all of these tumors are papillary carcinomas and many patients carry the RET/PTC oncogene. The SMNs are reported to be more aggressive than nonradiation-induced thyroid carcinoma. Though they are more aggressive, patients with radiation-related thyroid cancer are treated in the same way as nonexposed patients with thyroid cancer. Surgery alone or with radioactive iodine ablation is the primary mode of therapy. Lobectomy, subtotal, or total thyroidectomy are usually done depending on the extent of involvement of the thyroid gland and the stage of the tumor. Successful treatment of thyroid malignancies highly depends on accurate preoperative staging and for staging of the thyroid cancers the TNM staging system is widely used. Neck dissection (in conjunction with thyroidectomy) is recommended only if there is evidence of nodal involvement. Prophylactic dissection (i.e., removal of nodes that are normal clinically and radiologically) has not been shown to improve survival. Postoperative radioiodine ablation is recommended for all patients with known distant metastases, nodal metastasis, gross extrathyroidal extension of the tumor regardless of tumor size, and primary tumor >4 cm even in the absence of other high-risk features. The outcome of these SMNs after treatment is good and same as nonradiation-induced papillary carcinoma with 5 years survival rate of approximately 100% in Stage 1 and 2 diseases, 93% in Stage 3, and 51% in Stage 4 disease. Since the prevalence of thyroid cancer as SMN is still unknown and is probably underestimated, given that it poses a lifetime risk, patients in the reports are still young, and many patients with abnormal thyroid ultrasonographic findings still remain under observation. Ultrasound and magnetic resonance imaging (MRI) plays a major role in the noninvasive follow-up of thyroid gland abnormalities in children with previous head and neck irradiation. SMN is an uncommon serious late complication that affects the young population. Treatment protocols should be modified to reduce the risk for SMN without compromising the effectiveness of initial therapy. Lifelong follow-up with imaging modalities without ionizing radiation is mandatory for all childhood cancer survivors. Ultrasonography can be used for follow-up of accessible head and neck lesions, particularly for radiation-induced abnormalities of the thyroid and parotid glands. However, MRI is the technique of choice because of its multiplanar capabilities, high signal to noise ratio in the head and neck region and no risk of ionizing radiation to the patient. We would like to acknowledge the Department of Medical Oncology for referring the patient. Paulino AC, Fowler BZ. Secondary neoplasms after radiotherapy for a childhood solid tumor. Pediatr Hematol Oncol 2005;22:89-101. Gold DG, Neglia JP, Dusenbery KE. Second neoplasms after megavoltage radiation for pediatric tumors. Cancer 2003;97:2588-96. Meadows AT, Baum E, Fossati-Bellani F, Green D, Jenkin RD, Marsden B, et al. Second malignant neoplasms in children: An update from the Late Effects Study Group. J Clin Oncol 1985;3:532-8. Edwards-Brown MK, Jakacki RI. Imaging the central nervous system effects of radiation and chemotherapy of pediatric tumors. Neuroimaging Clin N Am 1999;9:177-93. Kimball Dalton VM, Gelber RD, Li F, Donnelly MJ, Tarbell NJ, Sallan SE. Second malignancies in patients treated for childhood acute lymphoblastic leukemia. J Clin Oncol 1998;16:2848-53. Moppett J, Oakhill A, Duncan AW. Second malignancies in children: The usual suspects? Eur J Radiol 2001;38:235-48. Kony SJ, de Vathaire F, Chompret A, Shamsaldim A, Grimaud E, Raquin MA, et al. Radiation and genetic factors in the risk of second malignant neoplasms after a first cancer in childhood. Lancet 1997;350:91-5. Vázquez E, Lucaya J, Castellote A, Piqueras J, Sainz P, Olivé T, et al. Neuroimaging in pediatric leukemia and lymphoma: Differential diagnosis. Radiographics 2002;22:1411-28. Parisi MT, Fahmy JL, Kaminsky CK, Malogolowkin MH. Complications of cancer therapy in children: A radiologist's guide. Radiographics 1999;19:283-97. Chen CY, Zimmerman RA, Faro S, Bilaniuk LT, Chou TY, Molloy PT. Childhood leukemia: Central nervous system abnormalities during and after treatment. AJNR Am J Neuroradiol 1996;17:295-310. Ball WS Jr., Prenger EC, Ballard ET. Neurotoxicity of radio/chemotherapy in children: Pathologic and MR correlation. AJNR Am J Neuroradiol 1992;13:761-76. Barkovich AJ. Pediatric Neuroimaging. 3rd ed. Philadelphia, PA: Lippincott Williams and Wilkins; 2000. Black P, Straaten A, Gutjahr P. Secondary thyroid carcinoma after treatment for childhood cancer. Med Pediatr Oncol 1998;31:91-5.
de Vathaire F, Hardiman C, Shamsaldin A, Campbell S, Grimaud E, Hawkins M, et al. Thyroid carcinomas after irradiation for a first cancer during childhood. Arch Intern Med 1999;159:2713-9. Raventos A, Duszynski D. Thyroid cancer following irradiation for medulloblastoma. Am J Roentgenol 1963;89:175-81. Andrew DS, Kerr IF. Carcinoma of thyroid following irradiation for medulloblastoma. Clin Radiol 1965;16:282-3. Acharya S, Sarafoglou K, LaQuaglia M, Lindsley S, Gerald W, Wollner N, et al. Thyroid neoplasms after therapeutic radiation for malignancies during childhood or adolescence. Cancer 2003;97:2397-403.